The Alliance for Healthy Food warns that one in three Mexican children will suffer from diabetes in their lifetime. With one-third of Mexican children likely to develop diabetes during their lifetime, a group of civic associations known as the Alliance for Healthy Food have called for the removal of junk food and related marketing from children’s lives. The Alliance for Healthy Food’s mass media campaign, entitled “What did your children eat today?” aims to raise awareness of this health crisis which is being fueled by excessive consumption of junk food and sugary drinks. 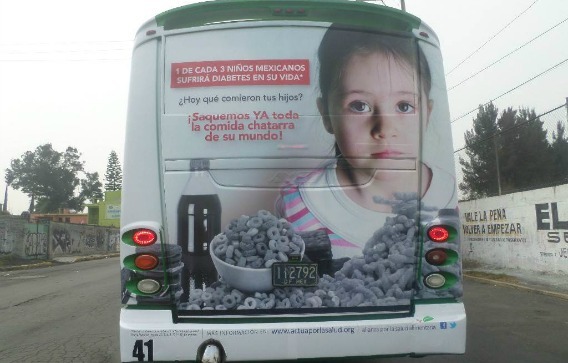 The campaign is targeted at parents, to encourage them to make better dietary choices for their children, and at lawmakers, to persuade them to pass more stringent legislation against junk food and sugary drink advertising that targets Mexican children. “Government officials and legislators have a decisive role to play everywhere in safeguarding the future of children,” said Alejandro Calvillo of the consumer rights organization El Poder del Consumidor, one of more than 20 public interest organizations and social movements that comprise the Alliance for Healthy Food. “When children see junk food and its pervasive marketing in every corner of their environment, and when the government and educators fail to inform consumers and children of the health risks of certain foods, we are failing our children,” Calvillo added. Mexico has the highest rate of adult obesity in the world, with one third of all adults obese, according to the UN Food and Agriculture Organization. One-third of children and seventy percent of adults are overweight or obese.